Here is a look at the tools and some of the techniques that will be useful in completing the projects in this book. The maker experience and mindset are about experimentation, iteration, and trial and error, so be sure to give yourself and your students room to explore, fail, and find work-arounds. Having some basic tools and techniques on hand will let you dive into that process. 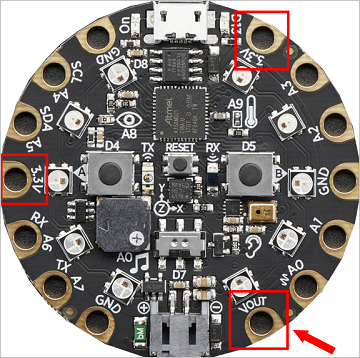 We strongly recommend using the 3xAAA battery pack provided with the Adafruit Circuit Playground Express kit. Lithium Ion and Lithium Ion Polymer batteries are a great power source for projects but they require care during use and charging. Lithium Ion and Lithium Ion Polymer batteries can be a fire hazard if not handled properly. Please read these guidelines on battery handling before you use them! Adafruit features many connectors and batteries, see the battery category. 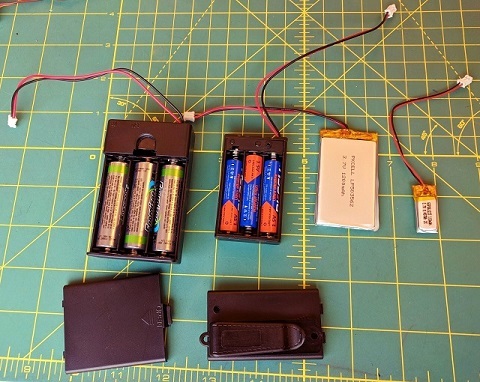 A variety of battery packs with JST connectors work well. These come in mini and standard sizes. The minis are easier to store and are better for smaller hands. They do require more frequent insertion of new glue sticks though. Be sure to order the correct size glue sticks for the glue gun you choose. Burns from the nozzle tips or the glue itself will happen, but they are rarely serious and serve as a reminder to be more careful in the future. 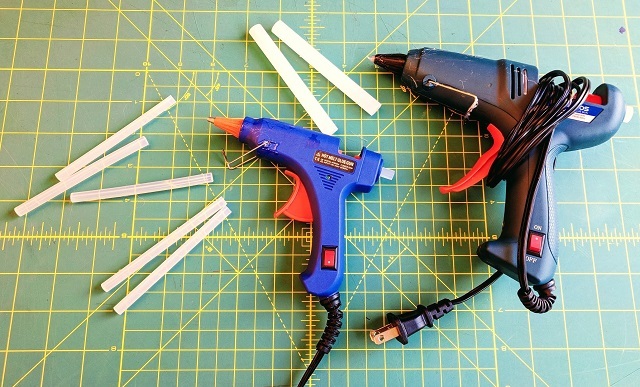 Look for glue guns that come with protective plastic nozzle covers that help prevent burns. 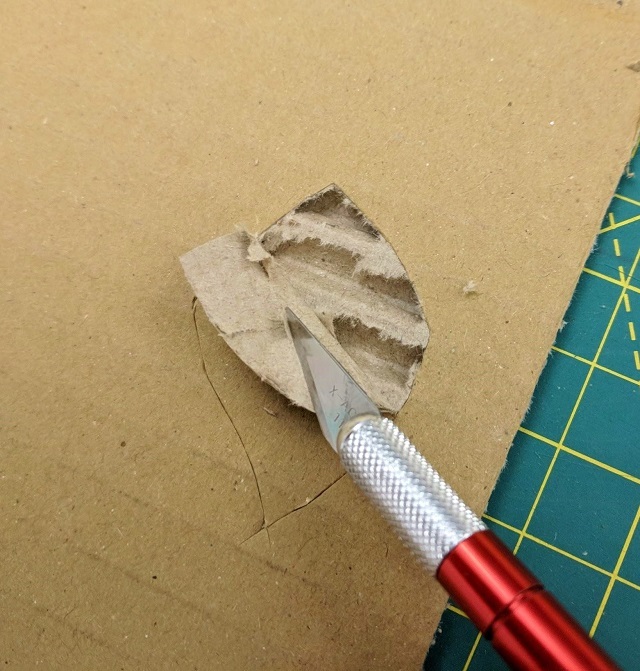 Normal scissors are not designed to cut cardboard and will often start to loosen at the hinge if used repetitively to cut cardboard. Shears, a saw, or a knife are a better bet. Deciding whether to let students use knives will depend on their age and temperament. It’s a good idea to emphasize that the hand that isn’t holding the knife should never be in the path of the blade. Teachers can also have a couple of cutting stations near each other where supervision is centralized. Another idea is to have students qualify to be able to use knives by passing a skills and safety test. It’s very handy to have different types of tape on hand. 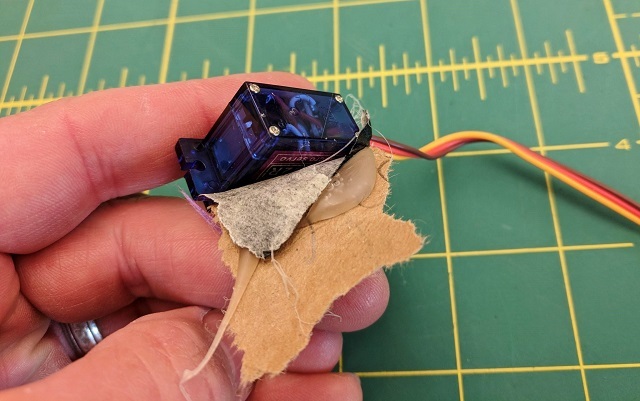 You should not apply hot glue to the Adafruit Circuit Playground Express, but a loop of tape on the back is often all you need to secure the device. 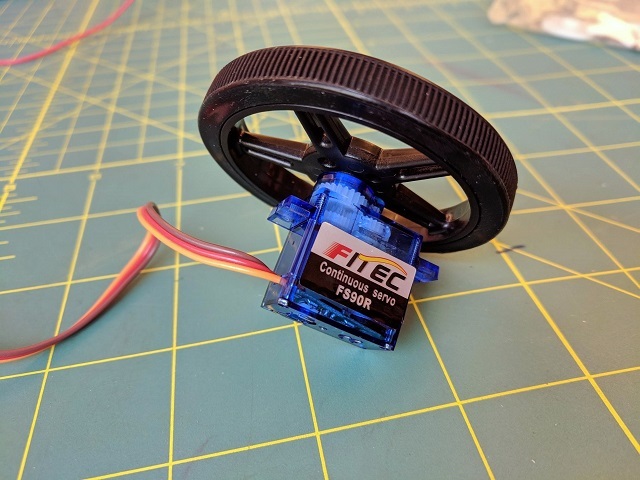 Masking tape is also great for wrapping around servo motors because you can then hot glue them and have an easier time getting them free of the glue. Self-healing cutting mats are really useful. They protect your table from damage, and the measuring lines can be helpful. 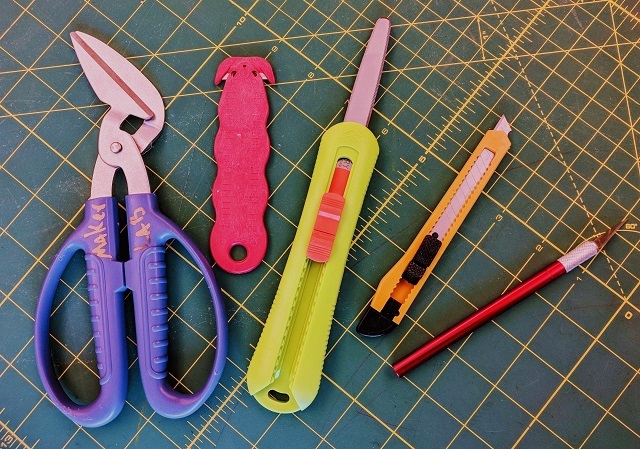 They usually come in a distinct blue or green color, so they are also effective at designating cutting stations in the classroom for supervision. Sheets of cardboard are another alternative. 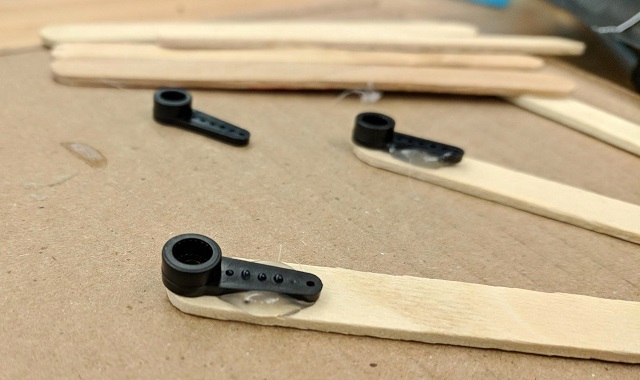 Popsicle or craft sticks are a great way to quickly extend the servo motor arm or “horn.” Hot glue the popsicle stick to the horn, but avoid getting glue in the hole that attaches to the servo motor. With a little work, the servo horn will come back off at the end of the project for reuse. A drill can be used on cardboard or, with gentle pressure, on popsicle sticks. Almost any pressure at all will split the popsicle stick, so plan to lose a few to splits before you master the technique. Zip ties are one of those pieces of equipment that doesn’t get used every day, but when they come in handy, they come in VERY handy. You can find them in various sizes and colors, and some can unzip while most will need to be cut apart to undo. 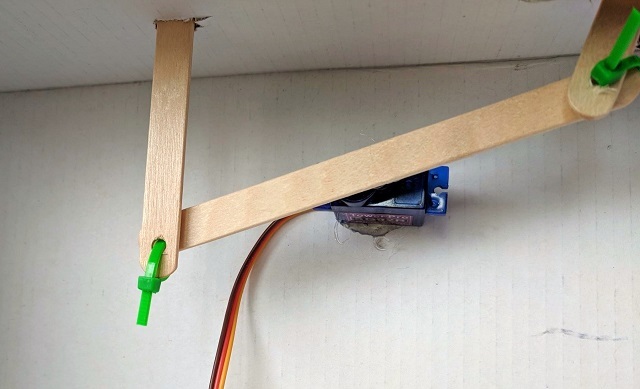 Connect a Adafruit Circuit Playground Express to something, hold down a servo motor, join two drilled popsicle sticks, and find other uses for this versatile item. Cardboard is the bread and butter of many maker spaces. You can source cardboard either from students’ families (who are often all too happy to help you out) or from local small businesses, who are usually also looking to unburden themselves of this great resource. Cutting the cardboard into squares and rectangles makes it easier to store if space is limited. Once the cardboard has done its service in your projects, it can usually go back into the recycling bin, hopefully destined for more great things. 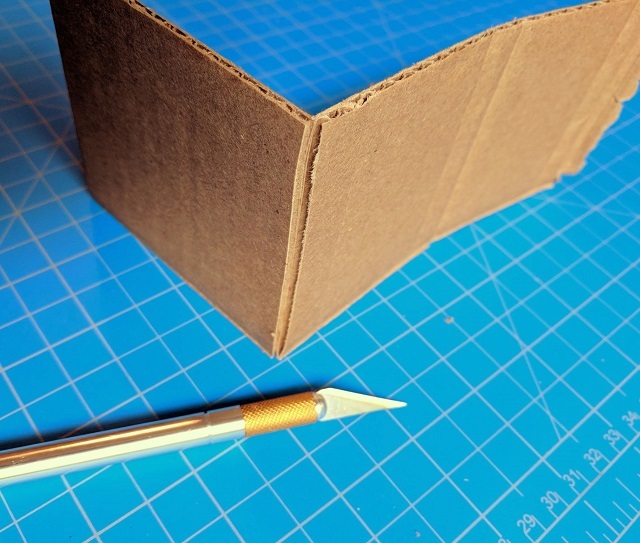 Basic cardboard is made up of two “liner” sheets with a curvy corrugated layer in-between. 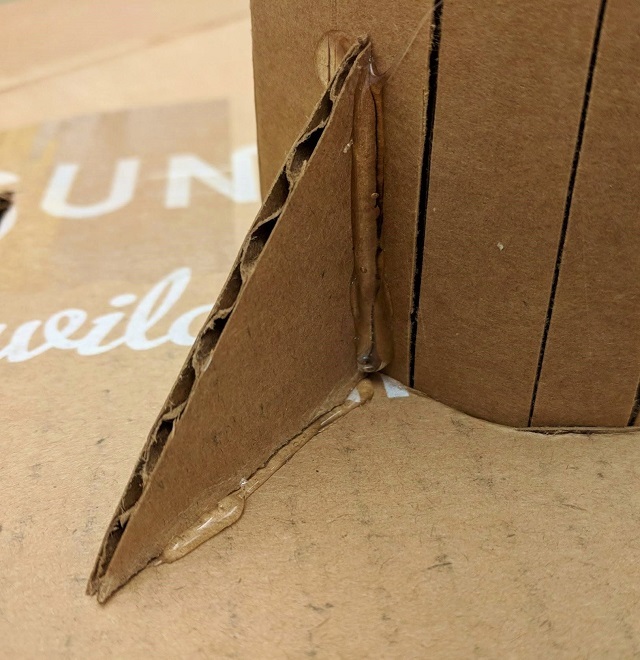 If you slice through a liner sheet along the U of the middle corrugation, you create a hinge that is easily bent. A single slice can allow you to turn 90 degrees to make a box, or any other angle. 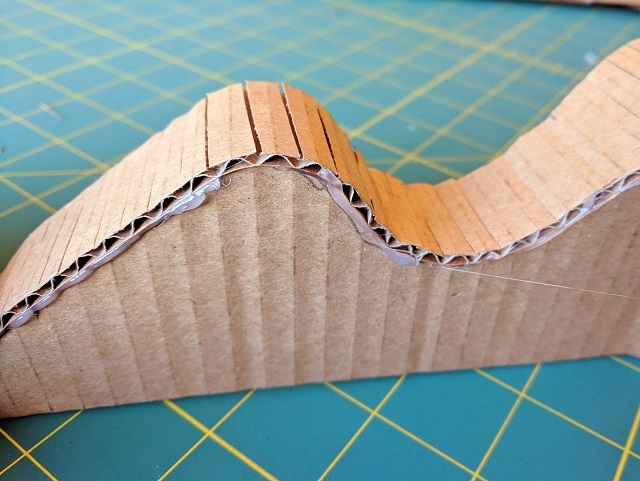 Multiple slices let you form the cardboard to follow curvy contours. Slice the sheet on the outside of the curve to allow it to bend correctly. Cutting through one of the liner sheets lets you remove it and expose the corrugations. This can be a neat way to add texture and design to projects. A gusset brace can prop something up vertically or can lend support to a structure. 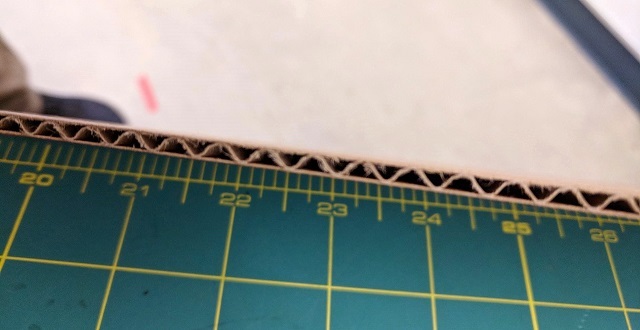 Cut the corners off a piece of cardboard to easily make 90-degree gusset braces, or make one at a different angle if needed, then trace it to make exact copies. 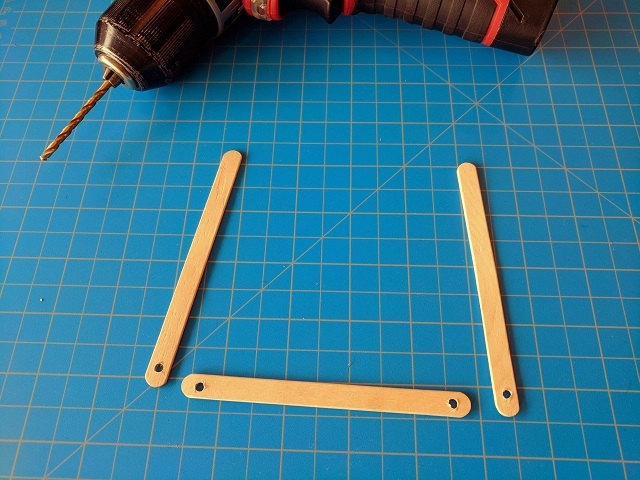 For larger braces, it can be handy to draw lines alongside the brace to indicate where your hot glue will go. Apply the glue next to or on the lines, then attach the gusset brace. Sewing techniques You can use conductive thread to attach NeoPixels to the Adafruit Circuit Playground Express and control their light patterns. 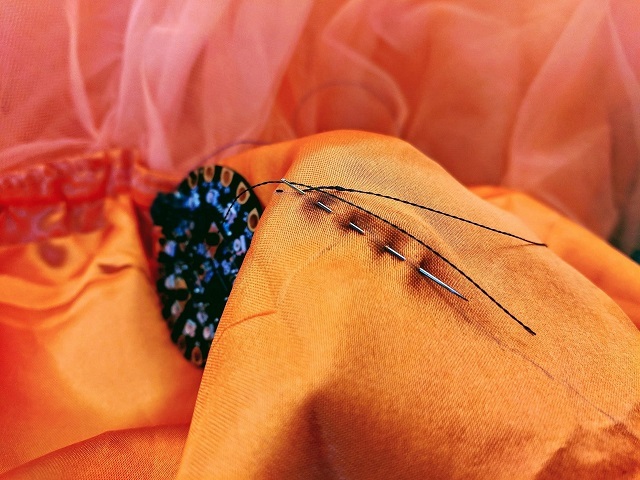 See below for some general sewing tips, and see the Fabric Friend and Wearable NeoPixels projects for further details on working with NeoPixels. A note on working with conductive thread – you will want to choose either 2-ply or 3-ply thread. Two ply is easier to tie secure knots in and is more thread-like, but 3 ply is stronger and makes a more secure electrical connection. 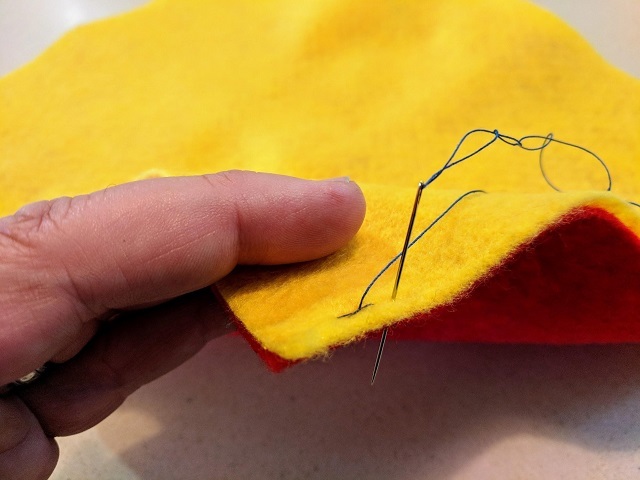 In either case, applying a dab of clear nail polish to any knots will help keep them from unraveling, and sewing your conductive thread both out and back between eyelets on components is good extra insurance. 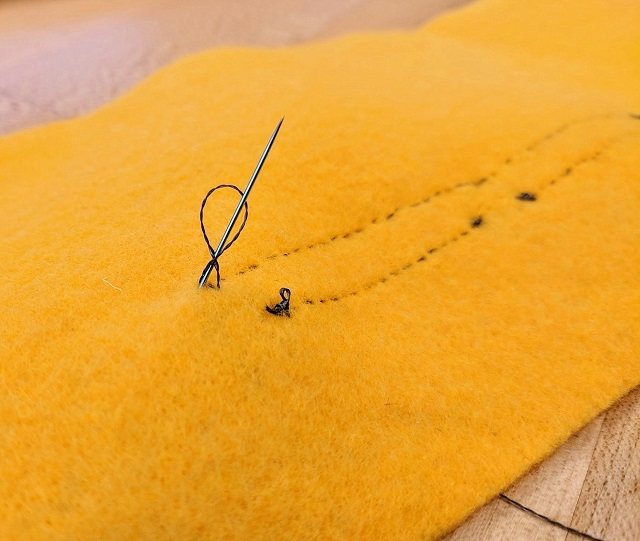 When starting to sew, here’s one method for knotting your thread at the beginning. Starting at the back of the material, run your needle out and back for one stitch. Leave a small tail. Tie the tail and the main thread together several times to form a secure knot. Trim off excess from the tail. A dab of clear nail polish will help conductive thread stay knotted. One method for knotting your thread at the end of line of stitches is to do your last stitch, but don’t pull it through all the way. Instead, leave a small loop on the back side of the material. Run the needle and thread through the loop, then pull to knot. Run the needle through that stitch a couple more times to secure the knot. A dab of clear nail polish will help conductive thread stay knotted. 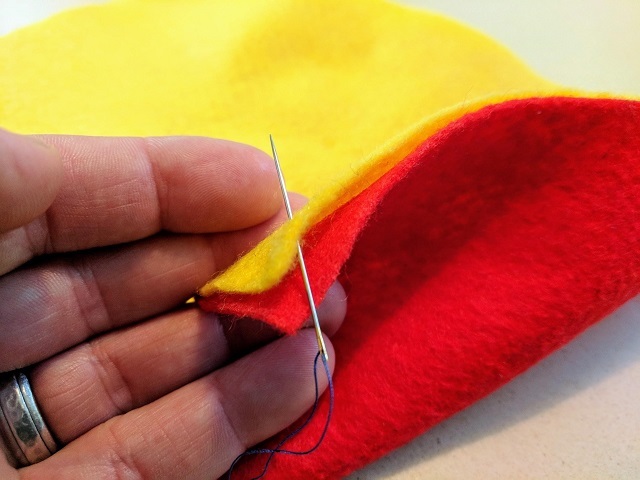 A running stitch in which you pass the needle in and out of the material several times before pulling the thread through can help save time on larger projects. 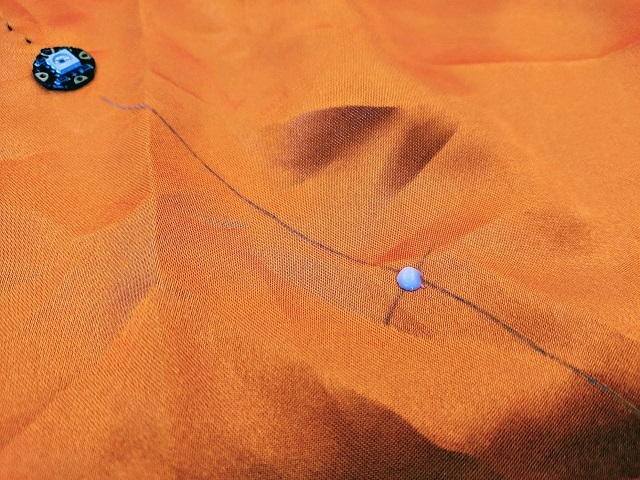 The multiple stitches at once technique works better on thinner materials. 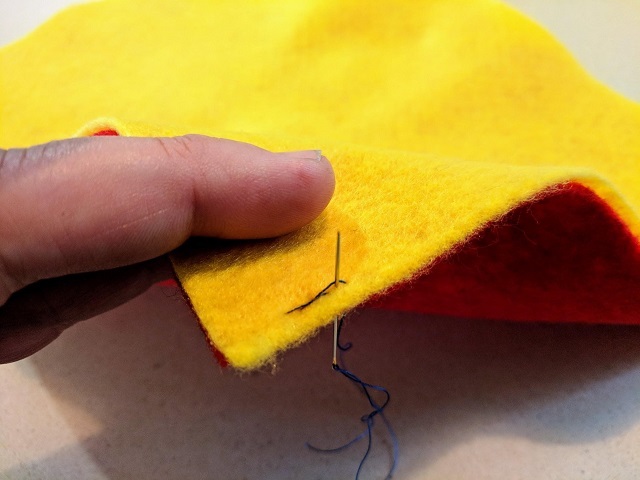 Whether you sew stitches one at a time or not, try to make the stitches close together, and be sure the thread does not constrict the material. 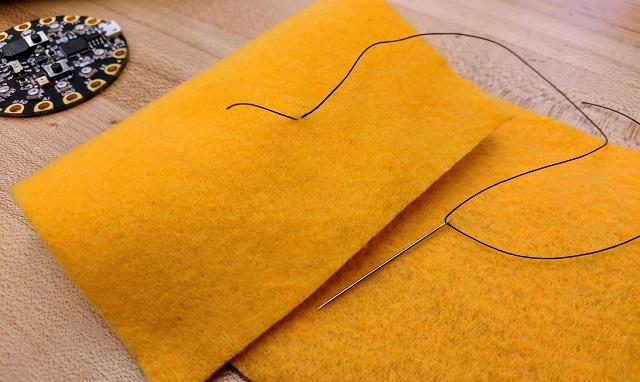 For the best connection with conductive thread, sew out and back between two components. The whip stitch and the back stitch are two common ways of joining material together. You have the option to join the two halves while reversed, then turn them inside out. 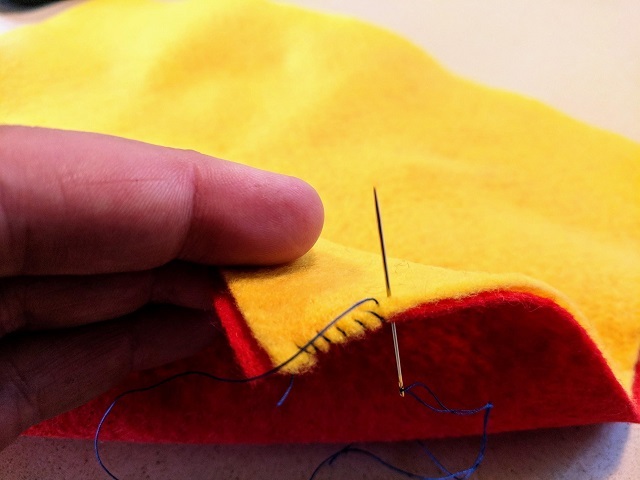 This method makes most of the stitching invisible, but it is trickier and is not a good idea for beginners. When starting to join two pieces of fabric, begin inside one of them. That way, the knot is hidden. The back stitch is a “one step forward, half a step back” stitch. You make a stitch, then come back to start the next stitch in the middle of the previous one. This forms a tight line of stitches that holds all kinds of filling well. The whip stitch runs along the outside of the two pieces of material. Come up through both pieces of material, then over the outside and back up again. Here, it would be up through red then yellow, then outside yellow and red, then back up through red then yellow. Tailor’s chalk is a handy way to indicate where the line of stitches will go, with a cross-hatch showing where to place the neopixel. 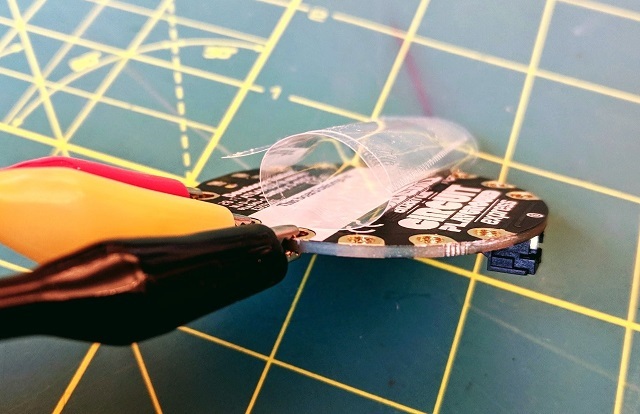 There is also a dab of fabric glue to hold the center of the neopixel in place. If you use fabric glue, be sure to avoid getting into the neopixel holes or else you’ll have a tough time getting the needle through. 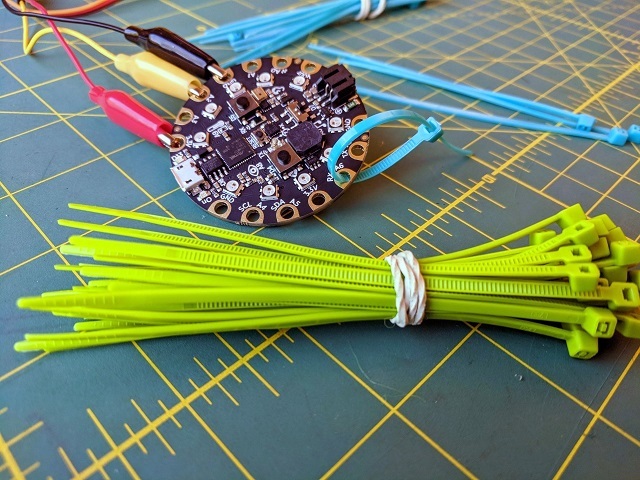 Double lines of conductive thread are more work, but they really help ensure a solid electrical connection. 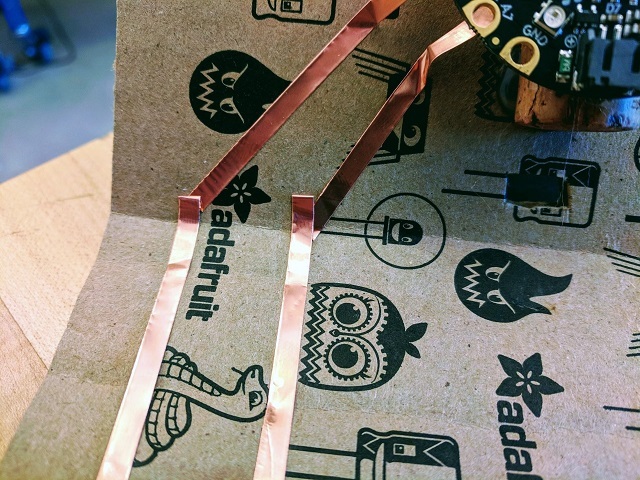 Conductive copper tape lets you extend the capacitive touch capabilities of the Adafruit Circuit Playground Express. Connect tape to any pin A1-7, select the “on pin click” input, and now your code will respond when you touch the tape. Move a servo motor when you touch copper tape connected to pin A1 on the Adafruit Circuit Playground Express. The only catch is that copper tape is a little tricky to work with, especially for younger makers. It tends to crinkle and fold on itself pretty easily. One technique is to only take it off the backing a few inches at a time as you spool out the tape. Another trick involves folding the tape to make angled turns. To do that, first fold the tape in the opposite direction you want to take it in, then fold back in the direction you want to go. 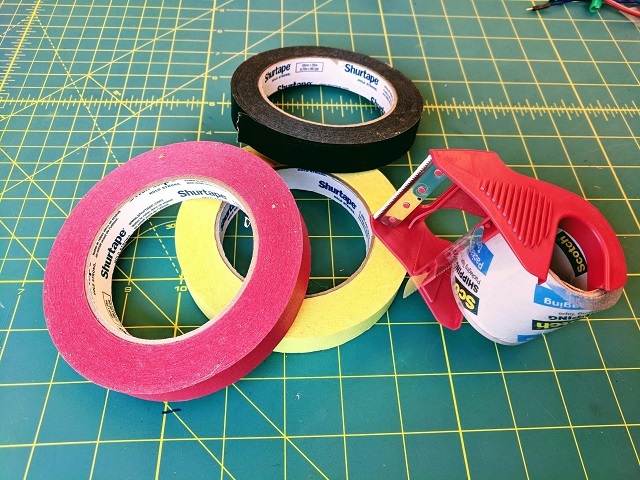 If you accidentally tear or break the tape, you can use conductive fabric tape patches to ensure you still get a good connection. Continuous motion or standard 180-degree servo motors are a great way to get motion into a project. 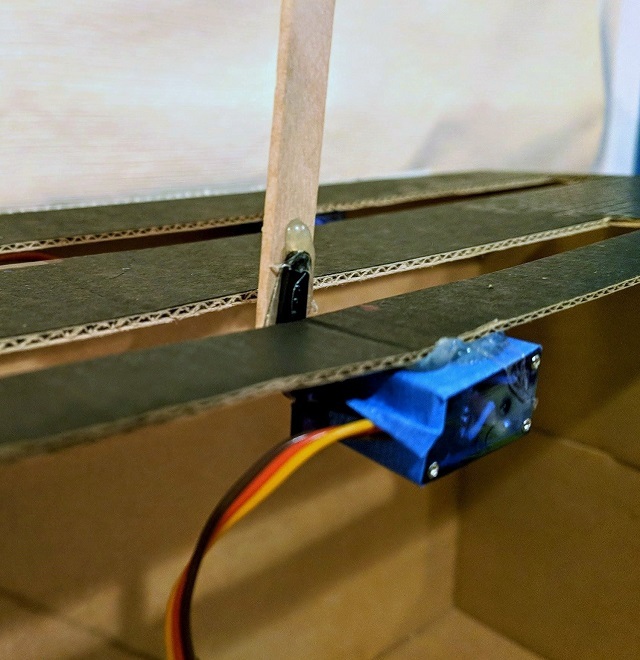 Wrap the servo motor body in a little masking tape so you can hot glue it to something, and add a popsicle stick with hot glue to the servo horn, to get started moving things in fun ways! Masking tape on the servo body lets you remove it more easily after hot gluing it to something. 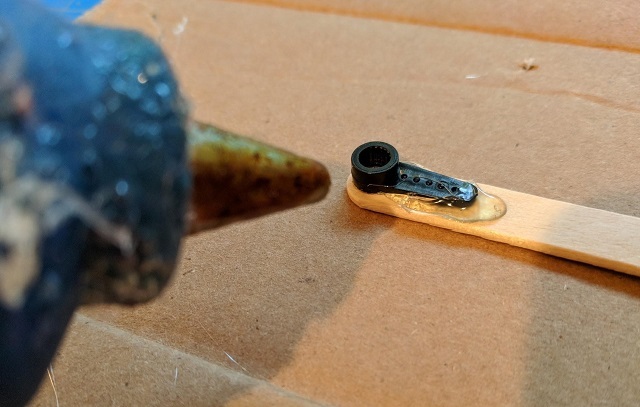 Hot glue applied to the parts of the servo horns that are outside the connection circle holds well and can be removed later. 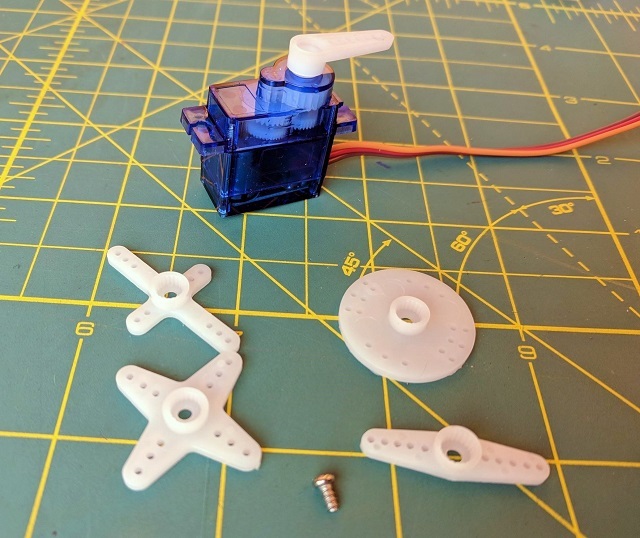 Continuous rotation servo motors can spin a servo horn with a stick or other material attached, or you can buy wheels to screw onto the motors to make vehicles. See the Light Bot project for more information on how to do this. 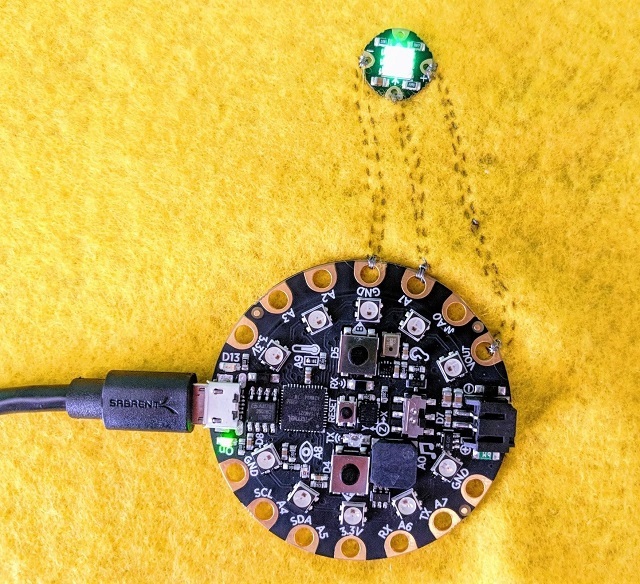 The Adafruit Circuit Playground Express can power and control up to two micro servo motors. 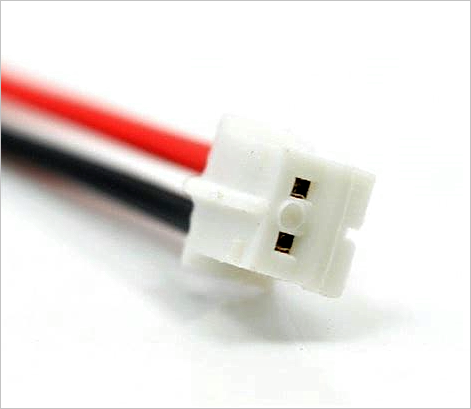 Ideally, a servo motor would be attached to the VOUT pin for sufficient power. The two 3.3V pins also work, but they under-power the servo a bit. For a complete look and using and coding servo motors, see this video. Note that servos can only be attached to pins A1 or A2.